Patna’s spruced up ghats: Oh, you have such a short time to stay! 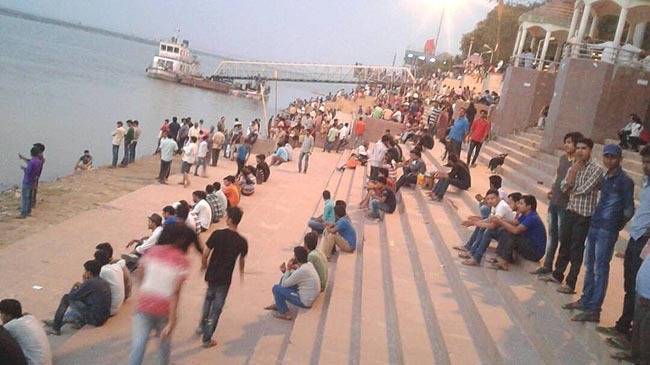 Amidst the splashing of water and tweeting of birds flocks of youths and teenagers converge to newly spruced-up ghats all along river Ganga, especially the Gandhi Ghat near NIT, Patna, every evening. They are no more visited just on the occasion of festivals; to perform last rites; or by washer-men and -women (dhobis) and a handful of those who take bath when the city runs out of water. After a sprinkling of drizzle in the afternoon, it was a lovely summer evening at Gandhi Ghat last week. Located in the backyard of lush green campus of NIT, Patna, the serenity of the Ghat turns mesmerising. Settled in these hushed settings, youths are drown into a host of activities ranging from readings books, having conversation with friend(s), listening to music, consumed in sightseeing to chatting and capturing moments (usually by taking selfie’s). 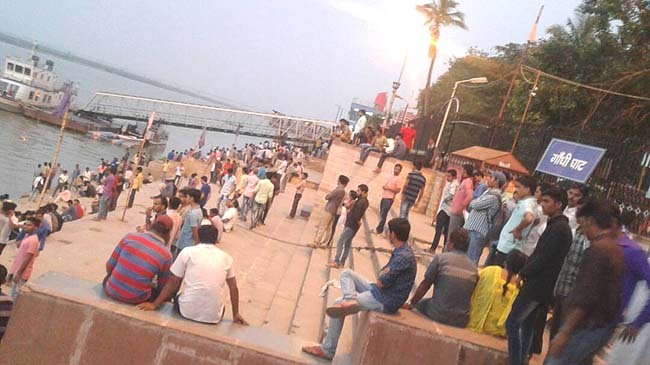 Ghat, Krishna Ghat, Rani Ghat are among those which witness hustle and bustle in this evening hour everyday. 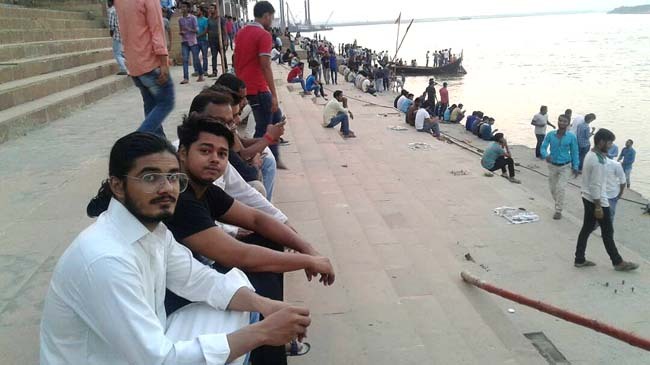 But Gandhi Ghat is somewhat different as it is on the back of sprawling campuses of premier educational institutions––NIT, Patna Law College and Patna Science. Obviously, the ambiance is arresting. Ghats offer perfect venue to rest the mind; a closest escape from the overcrowded vicinity. For a majority of the agile new generation the visit is all about fun and pleasure away from goals and gadgets. But for a few, the peace here is captivating even mystical. Engineering student, Shadab Ali Khan is one among later. “Initially I come to ghats for open space and fresh air but gradually I got somewhat addicted because of some strange good feeling every time I visit here,” he said. But they must all have one regret: at most of the ghats, especially in the western half of Patna, there is no/little water during the summer as the river drifts away from the city. Little did they realise that this pleasant scene is going to be short-lived. Soon Ganga Driveway, a proposed four lane road along the bank of the river, is going to break the tranquility of the place. At places roads linking Ashok Rajpath and Driveway would become motorable. The honks and horns would shatter the peace. Emissions from vehicles may pollute the air. On their part, while issuing environmental clearance to the project, authorities have tried to neutralize the much-feared deterioration. They stipulated conditions for discharging the untreated sewage water of the city. It was done with the view to checking the contamination of the holy river. Yet as it is obvious, peace and tranquility matter little in scheme of things of city-planners. In fact, city and peace are oxymoron. Seldom do they co-exist. In the meantime, before October 2019 (new extended deadline of completion of the road) elders are expected to convey the wisdom to the peace-addicts that loss of tranquillity is inevitable price for ‘development’ of the city.